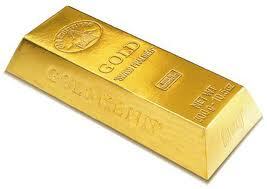 Why you better Cut the Crap: Service is the Old & New Gold. Service is the new gold. (credits: boomerang cards). Service is the Old and New Gold. Loads of consumers became disappointed in companies, products and services. As a result, corporations and organizations are sometimes seen as “evil”. I believe this is the result of what I call “the old marketing”. Most brands and organizations still rely on 20th century marketing principles: manufacture something against the lowest cost possible and consequently pay much money for advertising to create a positive image so that consumers buy your product. The only thing that matters is short-term profit, not a long-term sustainable contribution to society. I’ve always revolted against these types of companies. They are indeed “no good”. They don’t contribute to a positive society and consequently a better world. They do not “serve” their customers through good products, honest communication and real value. That marketing-enforced image however has always been put in perspective by the customers themselves by sharing their experiences: word of mouth. And what’s even more, word of mouth has always been the most trusted source of product or service information. Unfortunately it had little to no big scale leverage so that “evil” corporations could live happily ever after. So, if one customer was dissatisfied by the service he told it to about 20 people and didn’t rely on the company in the future any more. But for the company, that was not really a problem. The customers that decided to leave were replaced by new customers who bought the marketing story. I truly believe (and hope) the days of “high churn because we produce crap is solved by acquisition campaigns” are over as social peer-to-peer technologies became mainstream and leverage Word of Mouth on a huge scale. What is Service? Think long-term reputation vs. short-term profit. If one states that service is key, he needs to define what exactly is service. Based on my interviews, I’d say service is about small things, but things that can make someone’s day and stick in their memory. It’s about going the extra mile, about doing something you actually didn’t have to do. It’s about the goal to serve in order the make life (or businesses) easier and better. It’s the social aspect, it’s the human touch. It’s not about social media. Those only give large-scale opportunities to foster on this service behavior. As stated above and in the introduction, the above isn’t just a gut feeling. It’s inspired by real-life (analog) talks with leading people within several industries. 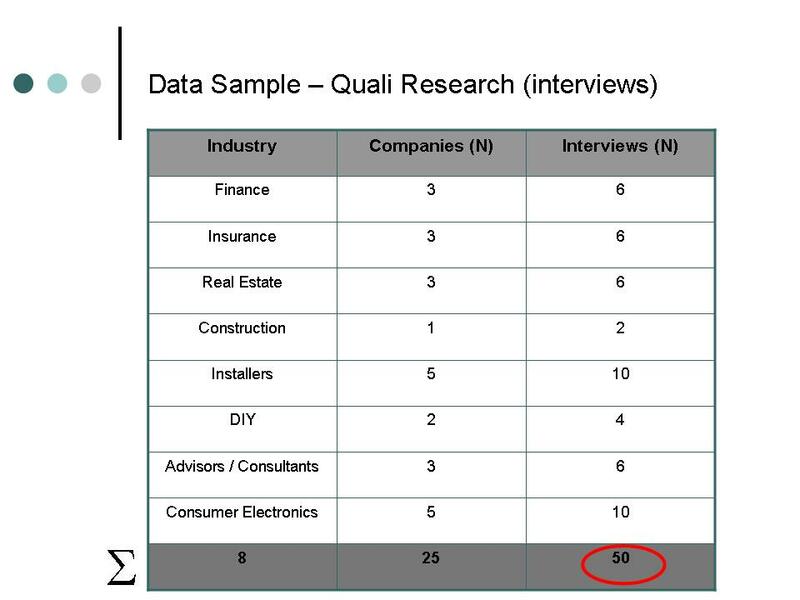 Below is a small overview of my data sample. Please allow me to just recycle one of the original research presentation slides. It’s important to realize that within this sample some of the companies were active on social media – which was the drive to act more service-wise – and others who were completely inactive on social but have always put the customer in the center of its existence. Future Role of Social Media for Belgian Railway Company NMBS. As a result of my latest ‘interim project’, I’ve been travelling to Brussels by train every single day for about 3 months. The choice for taking the train is rather logic. Belgium is world-leader in ‘urban sprawl’. One cannot expect to reach Brussels easily by car. Hence the choice of taking a one-and-a-half hour train ride. And as railway services are still a public service in Belgium, all journeys are organized by the same company: NMBS. NMBS is going through hard times these days. They cope with a genuine structural issue. Trains are cancelled and delayed daily. And what’s even more striking: customers are often not properly informed about cancellations and delays. My three months proved enough to realize NMBS can’t undo all timetable issues. After all, much has to do with the inability to expand some key railway stations (like Brussels). There’s simply no room for growth anymore. It’s a mobility and infrastructure problem. Let’s leave that to spatial planners, shall we? Those same three months however also proved sufficient to see that the NMBS could do much more with regards to customer service. And that’s an issue marketers and business people can tackle without spatial planners. So here we go. Do our customers want support through social media? Do we have employees willing to provide that service? Need for customer service on social media? Customers definitely want to be informed about delays and cancellations through social media. After all those platforms allow to give real-time personalized information. What’s more: with the ever-increasing adoption of smartphones, most travellers are constantly connected while on the train. It’s very interesting to see the artefacts of this need: the numerous unofficial NMBS Twitter accounts. Those accounts are basically bottom-up initiatives by real travellers who do not work for the company but do engage with a community of ‘train travelers”. No way you can ignore the need if you look at those accounts. Do we have resources to provide customer service via social networks? Yes! The NMBS most definitely has those resources. 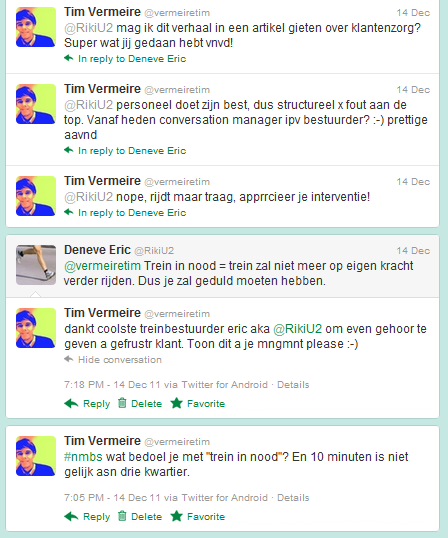 The image on the right depicts an image of a Twitter conversation between NMBS employees and a traveler. The Dutch conversation states: “we are pleading for this service! Correct, fast and clear information”. The above sentence points to an interesting aspect. The NMBS employees are actually aware of the situation and want to help. On the other hand, the corporation, hasn’t set up official structures to manage this. So in fact, NMBS is in a very strong position. They have employees who love their job and organization and want to speak about it publicly on social networks. That’s something most companies can only dream about. NMBS should take advantage of this high level of employee engagement. They should stimulate the current people to grow and contribute to overall customer satisfaction. Why should NMBS empower all employees on social? First of all, it’s quite unthinkable that railway services will remain a public service. As Belgium is a part of the European Union who always favors liberal, free and open markets, one can expect future guidelines and/or demands to liberalize the railway services market. We’ve seen those demands before within other industries like Telco, Energy and Postal services. Those industries are now typically known for their fierce competition and new customer focus (vs. customer service to bring value). If NMBS manages to set-up customer service through social media, it will have a competitive edge in a deregulated market. But then again, the question remains the same: Will the liberalization result in on-time services and consequently improve the customer’s quality of life? Frankly I don’t know. One should ask an Englishman to know whether private railway services are better than public railway services. Second, because of my experience which made me happy and willing to travel with NMBS for future endeavours. The story is detailed below. December 14 2011. I had a rather intense day at work. I was incredibly looking forward to a lazy evening with my girlfriend while traveling home by train. When suddenly the train came to stop in the middle of nowhere. That sometimes happens, but this time it took a lot of time. After 15 minutes, my co-travelers started to get worried and frustrated. After all, they were once again to be later at home than foreseen and – what seemed even worse – there was no information whatsoever about why we did not continue our journey anymore. At one moment however, after about half an hour, the intercom of the train informed us about “a prior train in need will cause a delay of this trip”. Hooray! We were informed. Nobody, including myself, however knew what a “train in need” exactly was. It was some sort of tipping point for most of the travelers, including myself. It triggered me to shoot the question “what is a train in need?” on Twitter. It was more a helpless act than that I expected to have an answer to the question. Nothing was less true however. 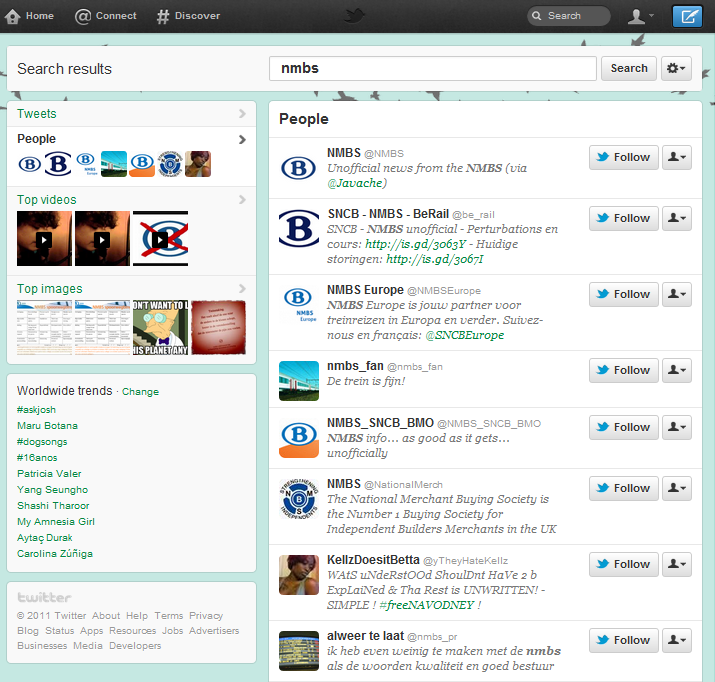 One clever train driver was at home and followed the #nmbs hashtag. As that hashtag was mentioned in my tweet, my demand came on the radar. I received an answer on my question and was consequently informed about the exact time delay, etc. Result: I could inform the people waiting for me, was happy again and was willing to continue traveling with NMBS in the future. What does all above teach us about the future role of social media for customer service? The above teaches us that social is truly a synonym for change. Things have changed and will continue to change. It would not be very intelligent to ‘ban’ social media platforms to employees. After all, they can act as a customer service representative or contribute to WOM advertising efforts, etc. For this reason companies should stimulate their employees to go online and speak in the name of the company. All companies should strive to realize this “superstar company state”. One great example of a superstar company is Dell – who transforms all employees into brand embassadors and certified customer service reps by providing them the necessary tools and training. The rise of Happiness Engineer & The Corporate pursuit of Happiness. After several months of bloglessness I finally got myself up-and-running again. Full of inspiration? Yes. And I still remember my password too. Great! But that’s only half-way there. Earlier this week, I couldn’t access my blog Administration. WordPress kindly informed me about the issues. The message was something similar to “Whoops! There’s something wrong. 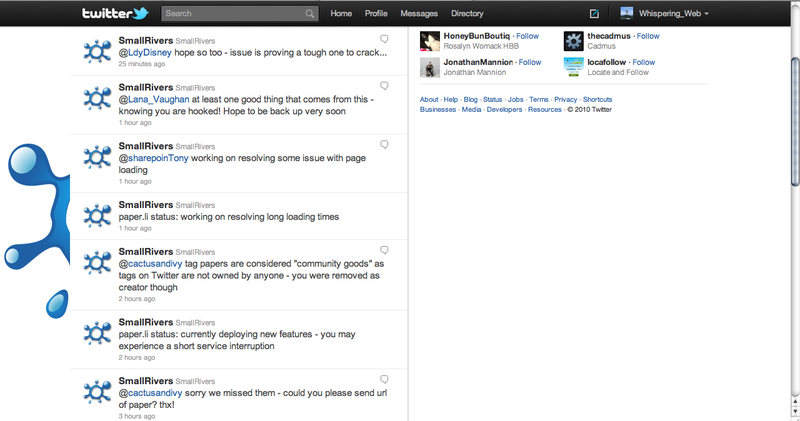 Please check the knowledge base for any known issues and if none of this helps, drop us a note”. So I did all of that but ended up dropping them that note. The issue got solved extremely quickly by Andrew. But I don’t want to talk about WordPress’s great support service today. Today I want to talk about Andrew. Andrew is a Happiness Engineer at WordPress. Happiness Engineer? What on earth? Well, WordPress probably met Marketing professor Jennifer Aaker and her research on “Happiness”. 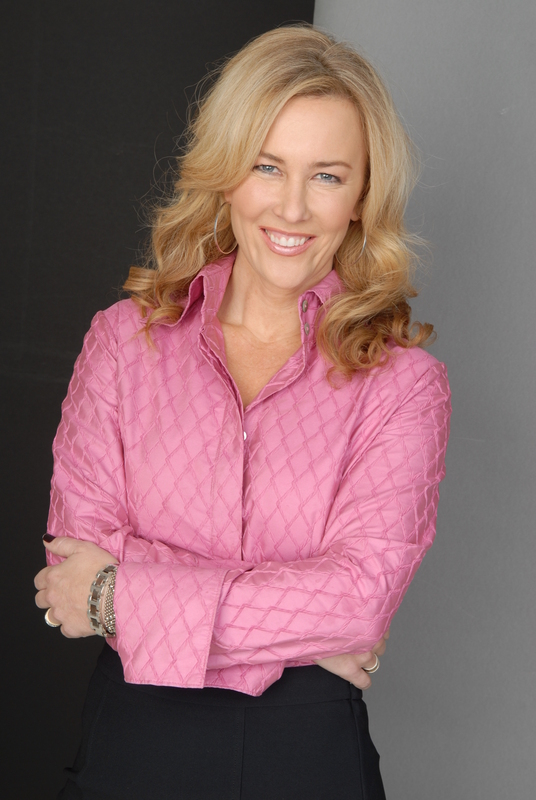 Jennifer Aaker is a well-known professor marketing. She studies psychology alongside marketing and spent the last several years studying the subject of “happiness”. How do people find happiness? How do they keep it? How do they manipulate it? How do they use it as a resource? The main finding of the study is that in fact a “meaningful experience” (e.g. : new skill) often makes people happier than moments of pure pleasure. This is what she and others call the “Paradox of Happiness”. Next to that, she discovered happiness is age-dependent. Young people relate happiness to excitement whereas elderly link it with peacefulness. But what’s more important to me is that Aaker soon discovered that the above little nuances were key for marketing and business. After all, she realized, brands are increasingly trying to appeal to consumer’s emotions to keep their sales going in these rough economic times. So she set up her theory and easily convinced the academic world that she was on to something – resulting in a graduate-level class “Designing Happiness” in one of USA’s leading business schools. But in today’s post-recession economy, where morale is low, brand owners and marketers tend to see the appeal of promising happiness along with their products as well. They realized that they could deploy happiness as any other commodity to sell something. Of course, the question is: how does one implement the ideas of Happiness into marketing and business? Let’s have a look at corporations that tried to integrate this entire “happiness idea”. got lectured by Aaker on the liaison between happiness and meaningful moments. The ideas were implemented through the “Adobe Youth Voices” project. The project allows children and teenagers from poor environments to use the Adobe software freely in order to create their story. experimented with the link between happiness and the brand. Just think about Coke’s “happiness machine” or the entire “open happiness” campaign. sources claim they have received lectures from Prof. Aaker but I don’t have an idea whether they implemented it in one way or another. 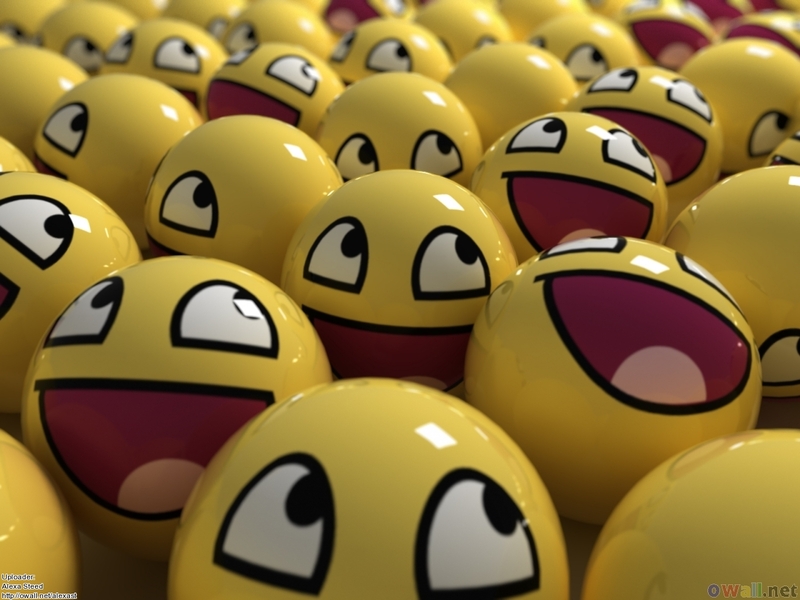 Benefits of “happiness-driven” marketing campaigns? Marketing Happiness is one of the few ways businesses can still appeal to people in a manner that feels authentic. That’s important, because people have an aversion to anything that feels overly manufactured. The concept of Marketing Happiness thus expands the idea of what it means to buy something. If you follow this theory, you believe that brands can provide greater meaning to the world for the consumer. One of those greater meanings could be things that enable happiness. Consequently the consumers want to share that happy moment and feeling as if the product is part of their lives and community (read: facebook likes, twitter mentions). As I mentioned earlier in this article, I dropped WordPress a note to register my issue. Most compelling about the whole support was the job name of the guy helping me out. Andrew is a Happiness Engineer. Guess his job is to engineer people into a happy state of mind, right? Now how can he make people happy? First, and this is what most people believe is sufficient, he can solve our technical problems as soon as possible. Second, he can inform us what the error is about and educate us about the skill required to fix it. Maybe next time I can do it myself. This is what’s going to make me really happy, according to Aaker’s findings. And it will probably make Andrew happy too. His work-load will decrease. Andrew choose the first option by the way. He solved it himself. Not teaching me anything. Maybe Andrew already figured I couldn’t fix it anyway. Aaker discovered that a meaningful experience (e.g. : new skill, volunteering, spending time with family) often makes people happier than moment of pure pleasure. Andrew, are you authentic? Do you really exist? Aaker believes marketing happiness could be one of the few ways business can still appeal to people in an authentic way. I doubt the authenticity of Andrew. Would an authentic human being out of flesh and blood e-mail you six times? Would he send recurring e-mails that bring you exactly the same message? I wouldn’t for sure. It felt like spam. And I’m quite convinced that you’d experience too much e-mails as “manufactured” as well. Didn’t Aaker learned us that we actually don’t like that? Aaker says that people have an aversion to anything that feels overly manufactured. Andrew, WordPress's Hapiness Engineer send me 6 e-mails. WordPress and Aaker did they ever had a date? just solve my problem. OK, it was solved fast, so I’m quite happy with that. not show any authenticity to me. Yes, too much e-mails feel robotized and spammy. I’m still in love with WordPress. This is just storytelling. You can always frame a story like you want to. I could have written it completely different. Just consider me framing it from the perspective of me being happy because of writing this article as a result of my initial Back-office issue. If you look at it like that, Andrew truly engineered me to be happy. After all, the true struggle was writing this blog post. Now that’s finished, I’m happy. Or suppose I wrote this story with a focus on the opposite approach “fear appeals”? Spence, H.E. ; Moinpour, R. (1972). “Fear Appeals in Marketing. A Social Perspective”. Journal of Marketing 36 (3): 39. Leventhal, H (1971). “Fear appeals and persuasion: the differentiation of a motivational construct”. American Journal of Public Health 61 (6): 1208. Dillard, J.P., & Anderson, J.W. (2004). The role of fear in persuasion. Psychology & Marketing, 21, 909-926. Witte, K. (1992). Putting the fear back into fear appeals: The extended parallel process model. Communication Monographs, 59, 329-349. I’ve also encountered this philosophy in political sciences. Let’s think e.g. on Adorno’s theory of the “authoritarian personality” (1950). Taken the above into account and from what I know from the “fear appeals” theory, one can hardly imagine that this could ever be an ethical way to promote your business value a.k.a. to organize your marketing around a.k.a. to use in your communications. We stumbled upon a lovely and promising web app called “paper.li”. The app organizes twitter feeds into a newspaper-format. Shall publishers and marketing departments soon embrace this innovative technology? Or does the technology need to support multiple output formats before they do? Of course we’ve been playing around with it and truly love it: great product. Have a look at the Whispering Web Daily! How will the publishing industry and brands embrace this? Will it be a necessity for paper.li to generate an iPad compatible “website”? Will those groups ask for a different experience, such as presenting the stream in the format of a “leaf-through digital document”? Will traditional publishers feel the need to organize the stream in a printable document? Stated differently: is a truly personalized newspaper to become reality in this manner? As we are publishing this article, the application is being updated. We wonder what the new features will be. Looking forward to it. But what’s at least equally important: SmallRivers – the app developer – not only builds innovative solutions. It also innovates its operations. In this respect, one could state that they strive to practice concepts as “Social CRM”, “BMI” and “enterprise 2.0”. 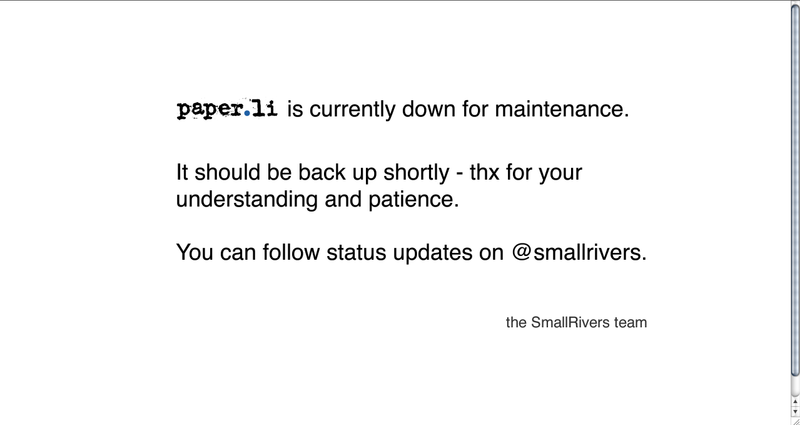 The update made clear that SmallRivers’ Customer Service deploys social media to inform their customers. In practice: twitter is used to inform them about the ongoing update. Just great! Social CRM, one aspect for BMI and enterprise 2.0 (e2.0)?